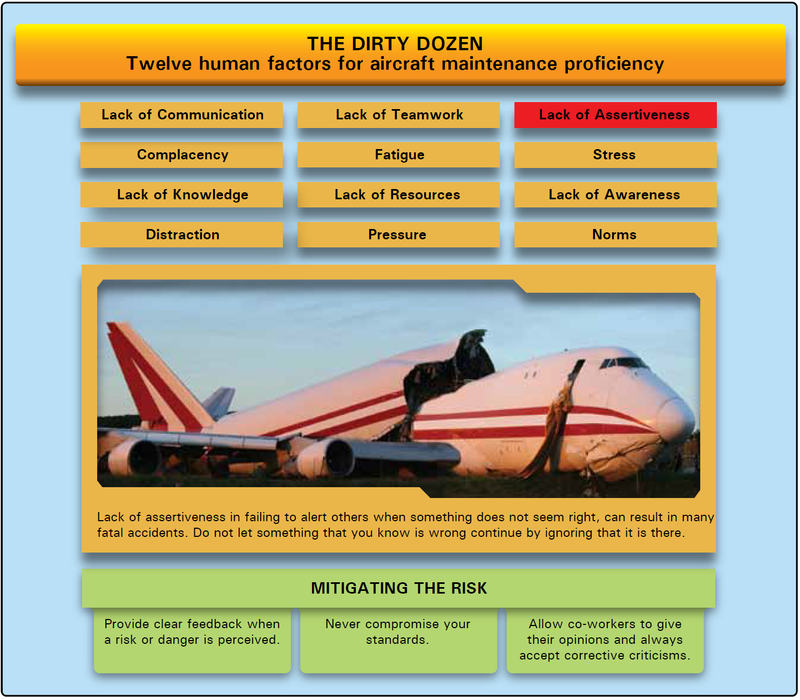 Due to a large number of maintenance-related aviation accidents and incidents that occurred in the late 1980s and early 1990s, Transport Canada identified twelve human factors that degrade people’s ability to perform effectively and safely, which could lead to maintenance errors. 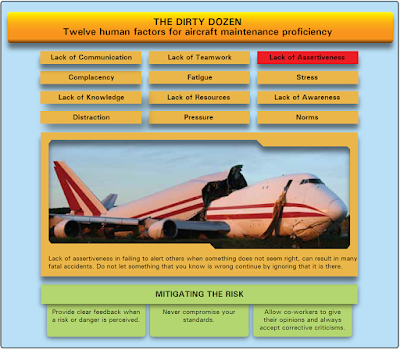 These twelve factors, known as the “dirty dozen,” were eventually adopted by the aviation industry as a straight forward means to discuss human error in maintenance. 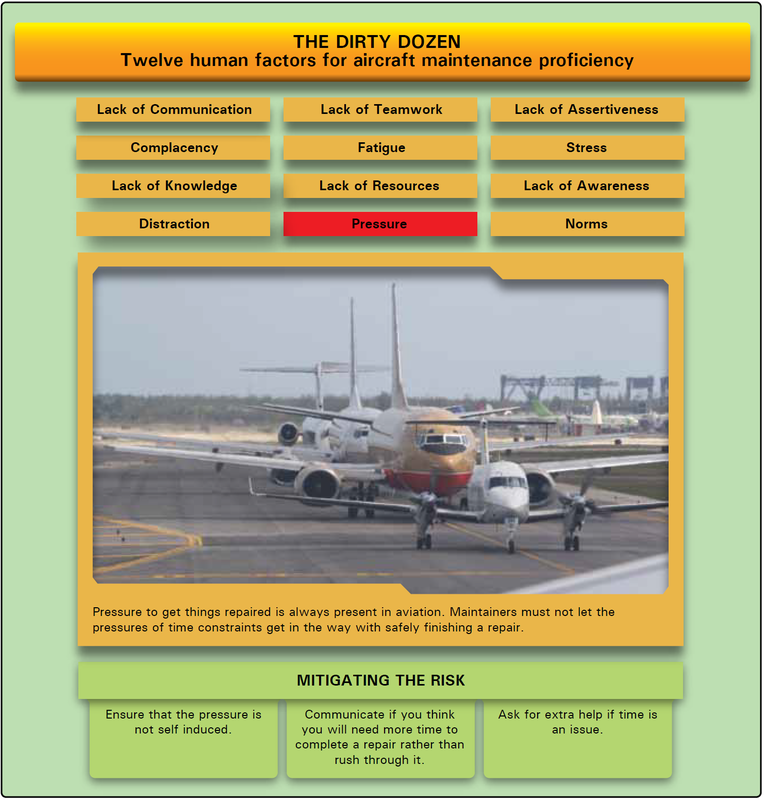 It is important to know the dirty dozen, how to recognize their symptoms, and most importantly, know how to avoid or contain errors produced by the dirty dozen. Understanding the interaction between organizational, work group, and individual factors that may lead to errors and accidents, AMTs can learn to prevent or manage them proactively in the future. 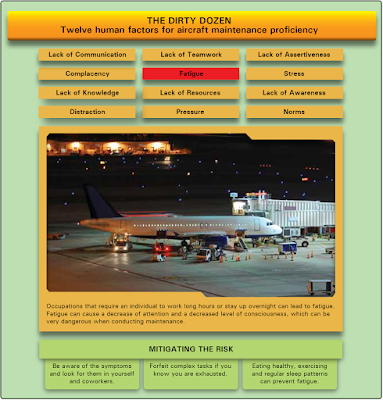 Lack of communication is a key human factor that can result in suboptimal, incorrect, or faulty maintenance. [Figure 1] Communication occurs between the AMT and many people (i.e., management, pilots, parts suppliers, aircraft servicers). Each exchange holds the potential for misunderstanding or omission. But communication between AMTs may be the most important of all. Lack of communication between technicians could lead to a maintenance error and result in an aircraft accident. This is especially true during procedures where more than one technician performs the work on the aircraft. It is critical that accurate, complete information be exchanged to ensure that all work is completed without any step being omitted. Knowledge and speculation about a task must be clarified and not confused. Each step of the maintenance procedure must be performed according to approved instructions as though only a single technician did the work. 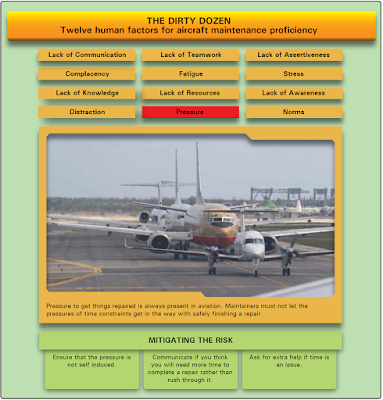 A common scenario where communication is critical and a lack thereof can cause problems, is during shift change in an airline or fixed base operator (FBO) operation. A partially completed job is transferred from the technician finishing his or her workday to the technician coming on duty. Many steps in a maintenance procedure are not able to be seen or verified once completed due to the installation of components hiding the work. No steps in the procedure can be omitted and some steps still to be performed may be contingent on the work already completed. The departing technician must thoroughly explain what has occurred so that the arriving technician can correctly complete the job. A recounting of critical steps and any difficulties encountered gives insight. A lack of communication at this juncture could result in the work being continued without certain required operations having been performed. The approved steps of a maintenance procedure must be signed off by the technician doing the work as it is performed. Continuing a job that has been started by someone else should only occur after a face-to-face meeting of technicians. The applicable paperwork should be reviewed, the completed work discussed, and attention for the next step should be drawn. Absence of either a written or oral turnover serves as warning that an error could occur. It is vital that work not be continued on a project without both oral and written communication between the technician who started the job and the technician continuing it. Work should always be done in accordance with the approved written procedure and all of the performed steps should bear the signature of the technician who accomplishes the work. If necessary, a phone call can be made to obtain an oral turnover when technicians cannot meet face-to-face at the work area. In general, the technician must see his or her role as part of a greater system focused on safe aircraft operation and must communicate well with all in that system to be effective. 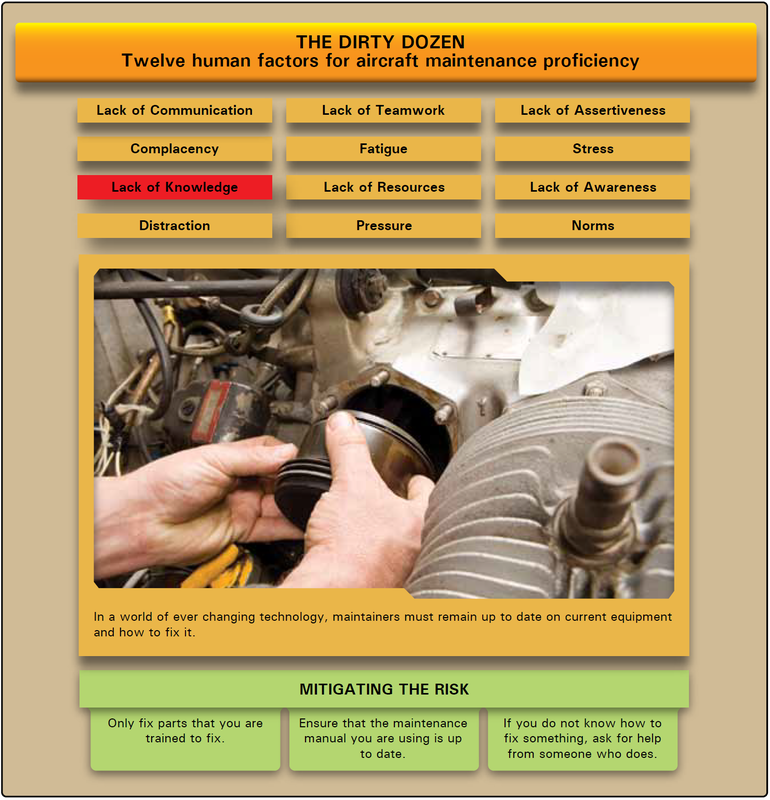 Complacency is a human factor in aviation maintenance that typically develops over time. [Figure 2] As a technician gains knowledge and experience, a sense of self satisfaction and false confidence may occur. A repetitive task, especially an inspection item, may be overlooked or skipped because the technician has performed the task a number of times without ever finding a fault. The false assumption that inspection of the item is not important may be made. However, even if rare, a fault may exist. The consequences of the fault not being detected and corrected could cause an incident or accident. Routine tasks performed over and over allow time for the technician’s mind to wander, which may also result in a required task not being performed. When a technician finds him or herself performing work without documentation, or documenting work that was not performed, it is a sign that complacency may exist. Approved, written maintenance procedures should be followed during all maintenance inspections and repairs. Executing the proper paperwork draws attention to a work item and reinforces its significance. To combat complacency, a technician must train oneself to expect to find the fault that created the inspection item in the first place. He or she must stay mentally engaged in the task being performed. All inspection items must be treated with equal importance, and it must never be assumed that an item is acceptable when it has not been inspected. A technician should never sign for any work that has not been performed. Prior to the pen touching the paper for a signature, the technician should read the item before signing and confirm it has been performed. A lack of knowledge when performing aircraft maintenance can result in a faulty repair that can have catastrophic results. [Figure 3] Differences in technology from aircraft to aircraft and updates to technology and procedures on a single aircraft also make it challenging to have the knowledge required to perform airworthy maintenance. All maintenance must be performed to standards specified in approved instructions. 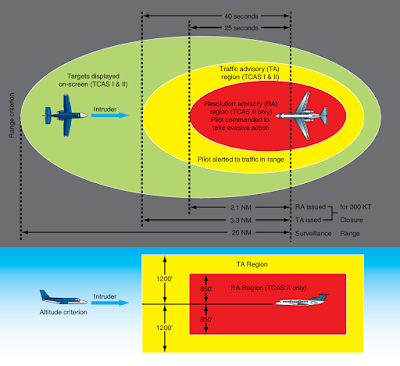 These instructions are based on knowledge gained from the engineering and operation of the aircraft equipment. Technicians must be sure to use the latest applicable data and follow each step of the procedure as outlined. They must also be aware that differences exist in the design and maintenance procedures on different aircraft. It is important for technicians to obtain training on different types of aircraft. When in doubt, a technician with experience on the aircraft should be consulted. If one is not available, or the consulted technician is not familiar with the procedure, a manufacturer’s technical representative should be contacted. It is better to delay a maintenance procedure than to do it incorrectly and cause an accident. A distraction while performing maintenance on an aircraft may disrupt the procedure. [Figure 4] When work resumes, it is possible that the technician skips over a detail that needs attention. 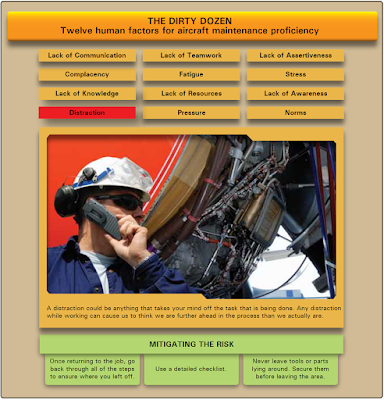 It is estimated that 15 percent of maintenance related errors are caused by distractions. Distractions can be mental or physical in nature. They can occur when the work is located on the aircraft or in the hangar. They can also occur in the psyche of the technician independent of the work environment. Something as simple as a cell phone call or a new aircraft being pushed into the hangar can disrupt the technician’s concentration on a job. Less visible is a difficult family or financial matter or other personal issues that may occupy the technicians thought process as work is performed. This can make performance of the required maintenance less effective. Regardless of their nature, numerous distractions may occur during the course of maintaining an aircraft. The technician must recognize when attention to the job at hand is being diverted and assure that work continues correctly. A good practice is to go back three steps in the work procedure when one is distracted and resume the job from that point. Use of a detailed step-by-step written procedure and signing off each step only after it is completed also helps. Incomplete work can be marked or tagged, especially when the technician is pulled from the work by a distraction, and it is unknown when work will be resumed and by whom. Disconnect any connector and leave it plainly visible if an installation is not complete. There is a tendency to think a job is finished when a component is “hooked up.” Similarly, when a step in the maintenance procedure is complete, be sure to immediately lock wire or torque the fasteners if required. This can be used as an indication that all is well up to that point in the procedure. 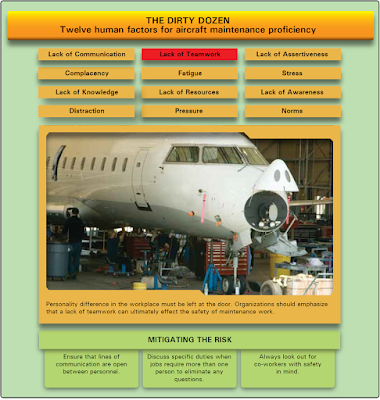 A lack of teamwork may also contribute to errors in aircraft maintenance. [Figure 5] Closely related to lack of communication, teamwork is required in aviation maintenance in many instances. Sharing of knowledge between technicians, coordinating maintenance functions, turning work over from shift to shift, and working with flight personnel to troubleshoot and test aircraft are all are executed better in an atmosphere of teamwork. Often associated with improved safety in the workplace, teamwork involves everyone understanding and agreeing on actions to be taken. A gear swing or other operational check involves all the members of a team working together. Multiple technicians contribute to the effort to ensure a single outcome. They communicate and look out for one another as they do the job. A consensus is formed that the item is airworthy or not airworthy. The technician primarily deals with the physical aspect of the aircraft and its airworthiness. Others in the organization perform their roles and the entire company functions as a team. Teams can win or lose depending on how well everyone in the organization works together toward a common objective. A lack of teamwork makes all jobs more difficult and, in maintenance, could result in a miscommunication that affects the airworthiness of the aircraft. Fatigue is a major human factor that has contributed to many maintenance errors resulting in accidents. [Figure 6] Fatigue can be mental or physical in nature. Emotional fatigue also exists and effects mental and physical performance. A person is said to be fatigued when a reduction or impairment in any of the following occurs: cognitive ability, decision-making, reaction time, coordination, speed, strength, and balance. Fatigue reduces alertness and often reduces a person’s ability to focus and hold attention on the task being performed. Symptoms of fatigue may also include short-term memory problems, channeled concentration on unimportant issues while neglecting other factors that may be more important, and failure to maintain a situational overview. A fatigued person may be easily distracted or may be nearly impossible to distract. He or she may experience abnormal mood swings. Fatigue results in an increase in mistakes, poor judgment, and poor decisions or perhaps no decisions at all. A fatigued person may also lower his or her standards. Tiredness is a symptom of fatigue. However, sometimes a fatigued person may feel wide awake and engaged in a task. The primary cause of fatigue is a lack of sleep. Good restful sleep, free from drugs or alcohol is a human necessity to prevent fatigue. Fatigue can also be caused by stress and overworking. A person’s mental and physical state also naturally cycles through various levels of performance each day. Variables such as body temperature, blood pressure, heart rate, blood chemistry, alertness, and attention rise and fall in a pattern daily. This is known as one’s circadian rhythm. [Figure 7] A person’s ability to work (and rest) rises and falls during this cycle. Performance counter to circadian rhythm can be difficult. Until it becomes extreme, a person may be unaware that he or she is fatigued. It is easier recognized by another person or in the results of tasks being performed. This is particularly dangerous in aviation maintenance since the lives of people depend on maintenance procedures performed at a high level of proficiency. Working alone when fatigued is particularly dangerous. The best remedy for fatigue is to get enough sleep on a regular basis. The technician must be aware of the amount and quality of sleep obtained. Caution or time off is justified when too little sleep has occurred and errors are probable during maintenance. Countermeasures to fatigue are often used. Effectiveness can be short lived and many countermeasures may make fatigue worse. Caffeine is a common fatigue countermeasure. Pseudoephedrine found in sinus medicine and amphetamines are also used. While effective for short periods, a fatigued person remains fatigued and may have trouble getting the rest needed once off the job due to this drug use. Suggestions to help mitigate the problems caused by fatigue include looking for symptoms of fatigue in one’s self and in others. Have others check your work, even if an inspector sign off is not required. Avoid complex tasks during the bottom of your circadian rhythm. Sleep and exercise daily. Eight to nine hours of daily sleep are recommended to avoid fatigue. AMTs in airline operations are part of a system in which most maintenance is performed at night. Fleet aircraft are operated primarily during the daytime hours to generate company revenue. Therefore, shift work is required to maintain the fleet. It is already known that turning work over to other technicians during shift change is a problem that can lead to errors due to lack of communication. But shift work alone is a cause of fatigue that can degrade performance and also lead to errors. Shift work requires technicians to work during low cycles of their natural circadian rhythm. It also makes sleep more difficult when not on the job. Furthermore, regular night shift work makes one’s body more sensitive to environmental disturbances. It can degrade performance, morale, and safety. It can also affect one’s physical health. All of these can be reflected in degraded maintenance performance—a dangerous situation. The technician must be aware that shift work is the norm in aviation. Avoidance of fatigue is part of the job. Title 14 of the Code of Federal Regulations (14 CFR) part 121, section 377, only requires 24 hours time off during a week of work. Since this is obviously not enough, it is up to companies and technicians to regulate shift work and time off to reduce the potential for errors. Most importantly, each technician must monitor and control his or her sleep habits to avoid fatigue. A lack of resources can interfere with one’s ability to complete a task because there is a lack of supply and support. [Figure 8] Low quality products also affect one’s ability to complete a task. Aviation maintenance demands proper tools and parts to maintain a fleet of aircraft. Any lack of resources to safely carry out a maintenance task can cause both non-fatal and fatal accidents. For example, if an aircraft is dispatched without a functioning system that is typically not needed for flight but suddenly becomes needed, this could create a problem. Parts are not the only resources needed to do a job properly, but all too frequently parts become a critical issue. AMTs can try to be proactive by checking suspected areas or tasks that may require parts at the beginning of the inspection. Aircraft on ground (AOG) is a term in aviation maintenance indicating that a problem is serious enough to prevent an aircraft from flying. Generally, there is a rush to acquire the parts to put the aircraft back into service and prevent further delays or cancellations of the planned itinerary. AOG applies to any aviation materials or spare parts that are needed immediately for an aircraft to return to service. AOG suppliers refer qualified personnel and dispatch the parts required to repair the aircraft for an immediate return to service. AOG also is used to describe critical shipments for parts or materials for aircraft “out of service” (OTS) at a location. If the status of an aircraft is AOG and materials required are not on hand, parts and personnel must be driven, flown, or sailed to the location of the grounded aircraft. Usually the problem is escalated through an internal AOG desk, then the manufacturer’s AOG desk, and finally competitors’ AOG desks. All major air carriers have an AOG desk that is manned 24 hours a day, 7 days a week by personnel trained in purchasing, hazardous materials shipping, and parts manufacturing and acquisition processes. Within an organization, making sure that personnel have the correct tools for the job is just as important as having the proper parts when they are needed. Having the correct tools means not having to improvise. For example, an aircraft that had received a new interior needed to be weighed prior to being released to fly. Two days before the planned release, the aircraft was weighed without the proper electronic load cells placed between the aircraft jack and the aircraft. Because the correct equipment was not used, the aircraft slipped off of one of the load cells and the jack point creased the spar. The cost of improvising can be very steep. The right tools to do the job need to be used at all times, and if they are broken, out of calibration, or missing, they need to be repaired, calibrated, or returned as soon as possible. 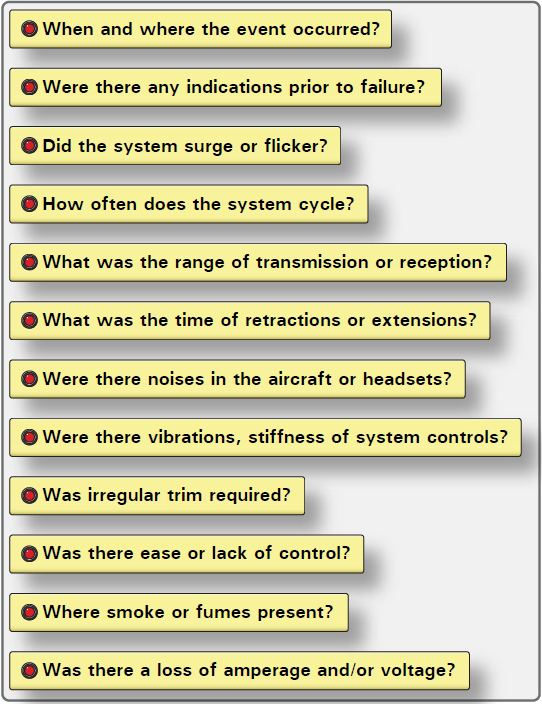 Technical documentation is another critical resource that can lead to problems in aviation maintenance. When trying to find out more about the task at hand or how to troubleshoot and repair a system, often the information needed cannot be found because the manuals or diagrams are not available. If the information is not available, personnel should ask a supervisor or speak with a technical representative or technical publications department at the appropriate aircraft manufacturer. Most manuals are in a constant state of revision and, if organizations do not identify missing information in the manuals, then nothing is done to correct the documentation. Resources, such as publication departments and manufacturer’s technical support, are available and should be used rather than ignoring the problem. 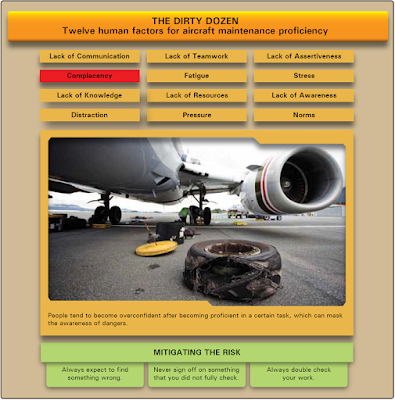 Another valuable resource that the maintenance department should rely on is the flight crew. Organizations should encourage open communication between the flight crews and the maintenance crews. 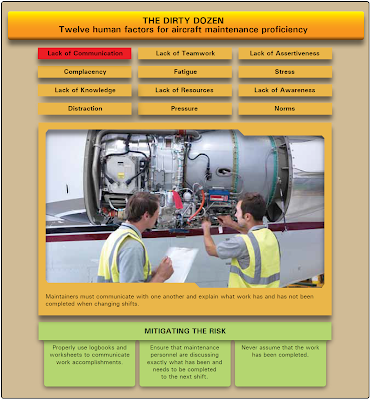 The flight crew can provide valuable information when dealing with a defective part or problem. Figure 9 shows a number of questions that flight crews can be asked to help resolve and understand maintenance issues. When the proper resources are available for the task at hand, there is a much higher probability that maintenance will do a better, more efficient job and higher likelihood that the job will be done correctly the first time. Organizations must learn to use all of the resources that are available and, if the correct resources are not available, make the necessary arrangements to get them in a timely manner. The end result saves time, money, and enables organizations to complete the task knowing the aircraft is airworthy. Aviation maintenance tasks require individuals to perform in an environment with constant pressure to do things better and faster without making mistakes and letting things fall through the cracks. Unfortunately, these types of job pressures can affect the capabilities of maintenance workers to get the job done right. [Figure 10] Airlines have strict financial guidelines, as well as tight flight schedules, that force mechanics to be under pressure to identify and repair mechanical problems quickly so that the airline industry can keep moving. Most important, aircraft mechanics are responsible for the overall safety of everyone who uses flying as a mode of transportation. Organizations must be aware of the time pressures that are put on aircraft mechanics and help them manage all of the tasks that need to be completed so that all repairs, while done in a timely manner, are completed correctly with safety being the ultimate goal. Sacrificing quality and safety for the sake of time should not be tolerated or accepted. Likewise, AMTs need to recognize on their own when time pressures are clouding their judgments and causing them to make unnecessary mistakes. Self-induced pressures are those occasions where one takes ownership of a situation that was not of their doing. In an effort to combat self-induced pressure, technicians should ask for help if they feel overwhelmed and under a time constraint to get a repair fixed. Another method is to have someone check the repair thoroughly to ensure that all maintenance tasks were completed correctly. Lastly, if given a repair with a specific time limitation that you do not feel is realistic or compromises safety, bring it to the attention of the organization’s management and openly discuss a different course of action. When being assertive with co-workers or management, deal with one issue at a time rather than trying to tackle a number of problems at once. It is also important to have documentation and facts to back up your argument, which can give people a visual account of what you are trying to explain. A lack of assertiveness in failing to speak up when things do not seem right has resulted in many fatal accidents. This can easily be changed by promoting good communication between co-workers and having an open relationship with supervisors and management. Maintenance managers must be familiar with the behavior style of the people they supervise and learn to utilize their talents, experience, and wisdom. As the employees become aware of behavior styles and understand their own behavior, they see how they unwittingly contribute to some of their own problems and how they can make adjustments. Assertive behavior may not be a skill that comes naturally to every individual, but it is a critical skill to achieve effectiveness. AMTs should give supervisors and management the kind of feedback required to ensure that they will be able to assist the mechanic to do their job. 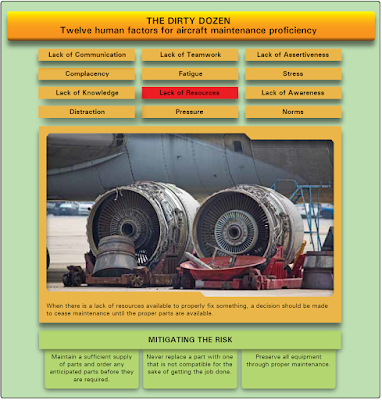 Aviation maintenance is a stressful task due to many factors. [Figure 12] Aircraft must be functional and flying in order for airlines to make money, which means that maintenance must be done within a short timeframe to avoid flight delays and cancellations. Fast-paced technology that is always changing can add stress to technicians. This demands that AMTs stay trained on the latest equipment. Other stressors include working in dark, tight spaces, lack of resources to get the repair done correctly, and long hours. The ultimate stress of aviation maintenance is knowing that the work they do, if not done correctly, could result in tragedy. Everyone handles stress differently and particular situations can bring about different degrees of difficulty for different people. For example, working under a strict timeline can be a stressor for one person and normal for another. The causes of stress are referred to as stressors. They are categorized as physical, psychological, and physiological stressors. Following, is a list of each and how they may affect maintenance. Physical stressors add to the personnel’s workload and make it uncomfortable for him or her in their work environment. Temperature—high temperatures in the hanger increases perspiration and heart rate causing the body to overheat. Low temperatures can cause the body to feel cold, weak, and drowsy. Noise—hangers that have high noise levels (due to aircraft taking off and landing close by) can make it difficult for maintenance personnel to focus and concentrate. Lighting—poor lighting within a work space makes it difficult to read technical data and manuals. Likewise, working inside an aircraft with poor lighting increases the propensity to miss something or to repair something incorrectly. Confined spaces—small work spaces make it very difficult to perform tasks as technicians are often contorted into unusual positions for a long period of time. Psychological stressors relate to emotional factors, such as a death or illness in the family, business worries, poor interpersonal relationships with family, co-workers, supervisors, and financial worries. Work-related stressors—over anxiousness can hinder performance and speed while conducting maintenance if there is any apprehension about how to do a repair or concerns about getting it done on time. Financial problems—impending bankruptcy, recession, loans, and mortgages are a few examples of financial problems that can create stressors. Marital problems—divorce and strained relationships can interfere with one’s ability to perform their job correctly. Interpersonal problems—problems with superiors and colleagues due to miscommunication or perceived competition and backstabbing can cause a hostile work environment. Physiological stressors include fatigue, poor physical condition, hunger, and disease. Poor physical condition—trying to work when ill or not feeling well can force the body to use more energy fighting the illness and less energy to perform vital tasks. Proper meals—not eating enough, or foods lacking the proper nutrition, can result in low energy and induce symptoms like headaches and shaking. Lack of sleep—fatigued, the maintainer is unable to perform to standard for long periods of time and can become sloppy with repairs and miss important mistakes. Conflicting shift schedules—the affect of changing sleep patterns on the body’s circadian cycle can lead to a degradation of performance. People cope with stress in many different ways. Specialists say that the first step is to identify stressors and the symptoms that occur after exposure to those stressors. Other recommendations involve development or maintenance of a healthy lifestyle with adequate rest and exercise, a healthy diet, limited consumption of alcoholic drinks, and avoidance of tobacco products. Lack of awareness is defined as a failure to recognize all the consequences of an action or lack of foresight. 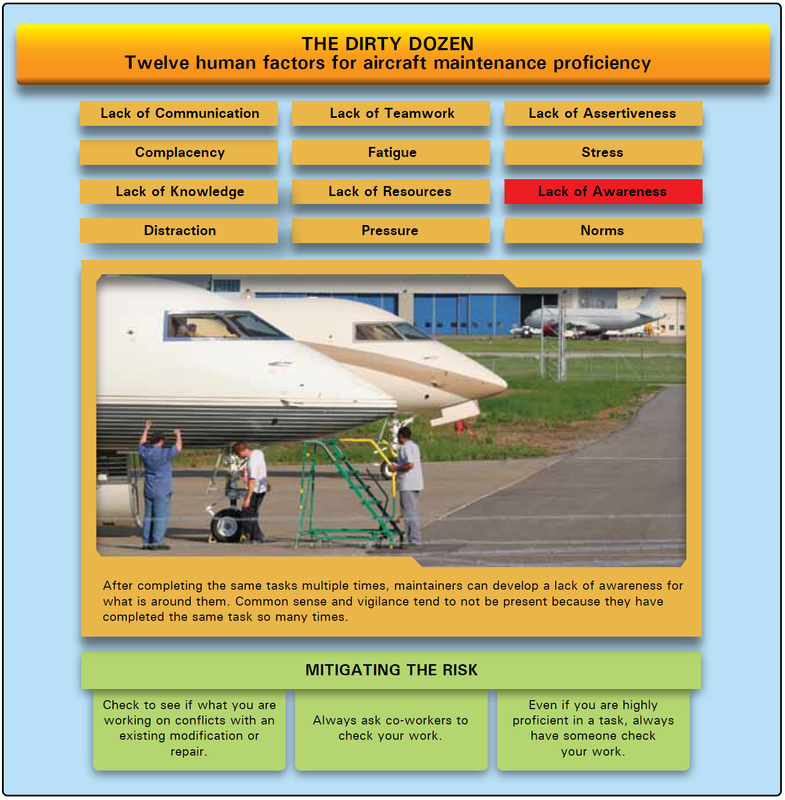 [Figure 13] In aviation maintenance, it is not unusual to perform the same maintenance tasks repeatedly. After completing the same task multiple times, it is easy for technicians to become less vigilant and develop a lack of awareness for what they are doing and what is around them. Each time a task is completed it must be treated as if it were the first time. Norms is short for “normal,” or the way things are normally done. [Figure 14] They are unwritten rules that are followed or tolerated by most organizations. Negative norms can detract from the established safety standard and cause an accident to occur. Norms are usually developed to solve problems that have ambiguous solutions. When faced with an ambiguous situation, an individual may use another’s behavior as a frame of reference around which to form his or her own reactions. As this process continues, group norms develop and stabilize. Newcomers to the situation are then accepted into the group based on adherence to norms. Very rarely do newcomers initiate change in a group with established norms. Some norms are unsafe in that they are non-productive or detract from the productivity of the group. Taking shortcuts in aircraft maintenance, working from memory, or not following procedures are examples of unsafe norms. Newcomers are better able to identify these unsafe norms than long-standing members of the group. On the other hand, the newcomer’s credibility depends on his or her assimilation into the group. The newcomer’s assimilation, however, depends on adherence to the group norms. Everyone should be aware of the perceptiveness of newcomers in identifying unhealthy norms and develop a positive attitude toward the possibility that norms may need to be changed. Finally, as newcomers become assimilated into the group structure, they build credibility with others. Once this has been done, a relative newcomer may begin to institute change within the group. Unfortunately, such actions are often difficult to do and rely heavily on the group’s perception of the newcomer’s credibility. Norms have been identified as one of the dirty dozen in aviation maintenance and a great deal of anecdotal evidence points to the use of unsafe norms on the line. The effect of unsafe norms may range from the relatively benign, such as determining accepted meeting times, to the inherently unsafe, such as signing off on incomplete maintenance tasks. Any behavior commonly accepted by the group, whether as a standard operating procedure (SOP) or not, can be a norm. Supervisors need to ensure that everyone adheres to the same standards and not tolerate unsafe norms. AMTs should pride themselves on following procedure, rather than unsafe norms that may have been adopted as regular practice.